Princess Ocansey was charged with Human Trafficking She was sending Gahnan women to be Domestic Workers in Dubai China and other countries ..
out of the Neko Tech center she called it called &amp;amp;amp;amp;amp;quot;SOS Labour&amp;amp;amp;amp;amp;quot; that Issac Hayes financed. She also delivered Scientology Auditing there. He co-founded the Nene Katey Ocansey I Learning and Technology (NekoTech) Center of Excellence in Ada, Ghana, with Princess Asie Ocansey of Ada. They were assisted by Isaac's spiritual advisor, Reverend Alfreddie Johnson founder of the World Literacy Crusade of Compton, USA. Isaac's first visit to West Africa was with another baritone man, the late Barry White in 1991, when the two went there to shoot a video for “Dark and Lovely (you over there)”. In 1992, Isaac accepted Dionne Warwick's invitation to join her on a visit to the Elmina and Cape Coast Castles in Ghana. He was hosted by Brother Akbar Mohammed of the Nation of Islam. It was at one of these speaking engagements on September 18, 1992, at Queens, USA, that the future King (Nkosuoehne of Ada ) met the Princess. Isaac met Naa Asie Ocansey, a Ghanaian Princess from Ada who attended the event with her husband. Princess Ocansey was deeply touched by the sincerity of Mr. Hayes to help Ghana and Africa. She presented Mr. Hayes with a symbolic handwoven royal kente cloth, thanking him for his concern for her people. Later the Princess arranged with her father, the late Nene Akrofi Kubi III (a kingmaker of the Ada Traditional area) to honor Mr. Hayes. In December 1992, when Isaac came to Ghana to perform at the PANAFEST, a grand coronation was held for him and he was given his new royal name, Nene Katey Ocansey I. (”Katey” means strong enough to calm a lion; the royal family name “Ocansey” means “I do as I say”). He wrote a check.. and Princess Asie Ocansey got a whirlwind tour of Scientology's Mecca_and a The Celebrity Center Gala in her honor ..
Princess Asie Ocansey web site... read it with a grain of salt shes a grifter..
Denzel Washington gave money to Issac Hayes Neko Tech project.. Her Excellency Rev. Dr. Ocansey is a princess of the Ocansey Royal Family of Ada, Ghana. She is a renowned Philantropist, an evangelist, lecturer, a Professional Engineer, a businesswoman, a songwriter, a mother for the motherless, a voice for the voiceless, a migration expert and radio show hostess. HE Rev. Dr. Ocansey co-founded the rural Nekotech Center of Excellence in her hometown-Ada, with the late USA mega entertainer, Mr. Isaac Hayes and co-founded the White House and Buckingham Palace recognized Save a Million Lives from HIV/AIDS Project with the African American National Medical Association and Student National Medical Association. She co-founded the Angels of Hope HIV/AIDS Orphan Support Program with US mega actor Steven Seagal. She is Co-chair of the ‘We Support Peace With Justice’ banner campaign for Middle East Peace, which gained the support of the UN Secretary General, HE Ban KI-moon. She was the featured personality of the recent World Bank Documentary: ‘Voices of a New Ghana’. She is also the co-chairperson of the US-Africa Ebola Working Group of Washington D.C., and was instrumental in mobilising the University of Alberta Symposium on Ebola where she gave a keynote address to raise global awareness and support for Ebola stricken countries. Having been educated at the prestigious Wesley Girls High School in Ghana and Rutgers University’s College of Engineering in the USA, HE Rev. Dr. Ocansey gained valuable working experience in the USA, working in Professional Engineering and Consulting positions with Fortune 500 USA companies, such as Pepsico and Johnson &amp;amp;amp;amp;amp; Johnson, while working on UNDP and UNEP/ICT Consulting international assignments. Gang investigators with the Los Angeles County Sheriff's Department have arrested a Lynwood city official on suspicion of felonies, including being an accessory to robbery and possessing a stolen handgun, a department spokesman said. When sheriff's gang investigators served search warrants, including one on Adams' Long Beach home, they found a loaded 9-millimeter handgun and photographs of Adams with armed gang members, the source said. The source, who asked not to be identified because he was not authorized to speak about the raid, said Adams was wanted as an accessory to crimes in which she allegedly provided rental vehicles for use by criminal suspects. Deputies also seized fraudulent credentials identifying Adams as a member of the Lynwood City Council. Adams is being held in lieu of $20,000 bail. Lynwood City Manager Roger Haley did not return calls for comment. the last 3 are the perfect qualifications for World Literacy Crusade Executive director! Does Central Basin Water Director Leticia Vasquez Live in Her District? Alfaruddie Praises Hubbtard at the end. at the Bottom of Hanan's bogus Biography.. Is a Metapsychologist certified thru the Traumatic Incident reduction Association. this event I covered on this thread ..
Ken Moxon sighting -a sign that Scientology Is micromanaging the World Literacy Crusade Gangs Fraud trial. J Swift is on it. audio Interview of Hanan Islam..after she and her kids were arrested for fraud...and their quack detox was shut down. the WLC gang along with with Tony Muhammad ..went to the state capitol in Sacramento to make some noise. Scientology and Nation Of Islam Education Hucksters Marching on Sacramento! DUNEDIN — When Hanan Islam and her management company took control of the struggling Life Force Arts and Technology charter school here last summer, she passed out lesson plans based on the work of Church of Scientology founder L. Ron Hubbard. She said Hubbard's &quot;study technology&quot; would enlighten children and help save the school. But grades from Florida's standardized FCAT test released Thursday show that, in one year under Islam's management, Life Force students' education suffered. Life Force's third- and fourth-graders scored the lowest or second-lowest passing rates in math, reading and writing of more than 300 elementary schools across Tampa Bay. &quot;It's a classic case of how a management company mismanaged this school, was paid an extraordinarily large fee for dismal services, and the ultimate victims were those poor children,&quot; said Dot Clark, the Pinellas County school district's coordinator of partnership schools. Third-graders took a more difficult test this year than last, resulting in lower average scores statewide. But even adjusting for the different standards, Life Force's FCAT math and reading scores worsened year-to-year. Only one of 14 third-graders at Life Force passed this year's reading test. Eight students scored in the lowest achievement level, leaving them at high risk of being held back. None of the third-graders passed math. DUNEDIN — After the Life Force Arts and Technology Academy's embattled director of operations said she was leaving for a new job, principal Lenor Johnson discovered a problem: Passwords to the charter school's bank accounts had been changed and she couldn't access them. Johnson had asked Vikki Williams, the outgoing operations director, for help learning the books. But when they sat down together, Williams couldn't explain why the accounts and the school's QuickBooks accounting software suddenly couldn't be accessed. That hasn't been the only surprise in the last few weeks at Life Force, a publicly funded charter elementary school that teachers say was overrun by Scientology influence. School leaders and parents say the school's books have turned to smoke and mirrors, leaving them powerless to plan a budget or hold the school's former leaders accountable. And Life Force's bankruptcy protection likely will end this month, allowing creditors to move in and seek payment. Hanan Islam, the school's former manager and an executive director of the Scientology-tied World Literacy Crusade, quit last month. But teachers say her appointees have retained a tight grip on the school's money and operations. The only remaining member of the school's governing board, Hanan Islam appointee Louis Muhammad, now has sole power to approve budgets for the approximately $50,000 in public funding the school receives each month. the Smart Academy was what they were calling Life Force Academy..
the third video Is of Lenora Johnson who was the principal an Is not a Scientologist ..Lenora was interview by Drew Harwell in the Tampa Tribune in the links above. still trying to milk the front group... Alfreddie Isn't a draw..
Peter Bonyai asked us if we’d seen a three-year-old video put out by Scientology which features one of our favorite performers, Scientology’s in-house hip hop giant, Chill EB. We told him we weren’t sure, but we really didn’t need much excuse to visit it again as long as the Chillmaster was in it. Unfortunately, you have to sit through a lot of really boring scene-setting by the masters at Golden Era Productions in his video as it tries to build a mood and cast a spell over its intended audience — Scientologists who are likely sick and tired of forking out their hard-earned cash to the International Association of Scientologists (IAS). But once it gets going, not only are we treated to a few glimpses of Chill, but the hard rap line is laid down by none other than Rev. Alfreddie Johnson — yes! The Literacy King himself! Alfrauddie Is a big shot Now..
the gang doesn't have don't have the 3 million in beans for restitution . Ed Runs a security services business, Haynes Security services inc.
Our man in Los Angeles, Jeffrey Augustine, did us a huge favor by attending a preliminary hearing yesterday at Los Angeles Superior Court. And that’s why we can tell you that Hanan Islam and her fellow defendants, including three of her own children, are scheduled to go to trial on August 28 for defrauding the state’s Medi-Cal insurance program with the use of a Scientology front operation. You may not have seen a word about it in the Los Angeles Times, but this is a fairly astounding alleged crime that involved putting unwitting high school students into a Scientology rehab in order to rip off about $3 million from the state. When the scam was uncovered by state insurance investigators, it ended the careers of three prominent African-American educators in Compton, a working-class Los Angeles suburb. Augustine tells us that Judge Michael Tynan seemed pretty fed up that the case has taken so long to come to trial, nearly three years since charges were brought against Islam, three of her children, and two other employees who allegedly took part in the scam. After granting a continuation to August 28, the judge made it plain that the trial would not be put off any longer. Both sides agreed that the criminal trial would probably last about four sessions on four consecutive afternoons. Augustine also told us that Islam’s attorneys said the family doesn’t have $3 million to pay in restitution. Back in December 2015, we first described the complex scheme. In 2004 Hanan Islam founded “American Health and Education Clinics,” an entity that was actually run out of the World Literacy Crusade, a well known Scientology front in Compton where she was executive director. From 2010 to 2013, Islam operated the Compton clinic as a Scientology “Narconon” drug rehab center, and managed to figure out a way to bill Medi-Cal for patients undergoing treatment. (Most of the country’s Narconon centers demand cash up front — usually about $33,000 — and don’t tap into state or federal insurance programs.) In order to pump up the numbers of patients, the clinic allegedly worked out a deal with three local high schools, who supplied unwitting students to the clinic to go through the Scientology rehab — even though they were not addicts and didn’t need to undergo drug withdrawal. In March 2014, the state’s Bureau of Medi-Cal Fraud and Elder Abuse, a part of the state’s Department of Justice under then-Attorney General Kamala Harris (now a US senator), raided the clinic and broke up the scheme. As a result, Rudy Washington, principal of Chavez Continuation High School, Jesse L. Jones, principal of Centennial High School, and Keith Donerson, coach of the legendary football team at Manuel Dominguez High School, were each charged with Medi-Cal fraud in October 2014 and were later fired. A year later, in October 2015, Hanan Islam was charged with four felony counts, which include grand theft larceny, insurance fraud, Medi-Cal fraud, and failure to file a tax return. She pleaded not guilty to all counts. Three of the 58-year-old’s ten children were also charged with felonies. Zakiyyah Islam, 39, pleaded not guilty to charges of grand theft larceny, insurance fraud, and Medi-Cal fraud. Nimat Islam, 41, and Ronnie “Rizza” Islam, 28, pleaded not guilty to insurance fraud and Medi-Cal fraud. Two additional clinic counselors were charged, Bayon Beverly Washington, 44, and George Edward Newby III, 46, who each pleaded not guilty to insurance fraud and Medi-Cal fraud. World Literacy Crusade was founded in 1993 by Alfreddie Johnson Jr., a Baptist minister who turned to Scientology in the wake of the L.A. riots and became one of Scientology’s most well known African-American figures. It was Johnson who was responsible for bringing musician Isaac Hayes into Scientology in the mid-1990s, and a decade later connected Nation of Islam leader Minister Louis Farrakhan with Scientology in what has become an ongoing and bizarre melding of the two groups. Johnson not only founded World Literacy Crusade but with Hanan Islam also co-founded American Health and Education Clinics, the entity delivering the Scientology drug rehab program. Hanan Islam has worked for years with Johnson, and they are the parents of Islam’s youngest child, Ronnie, who is better known as Rizza Islam. 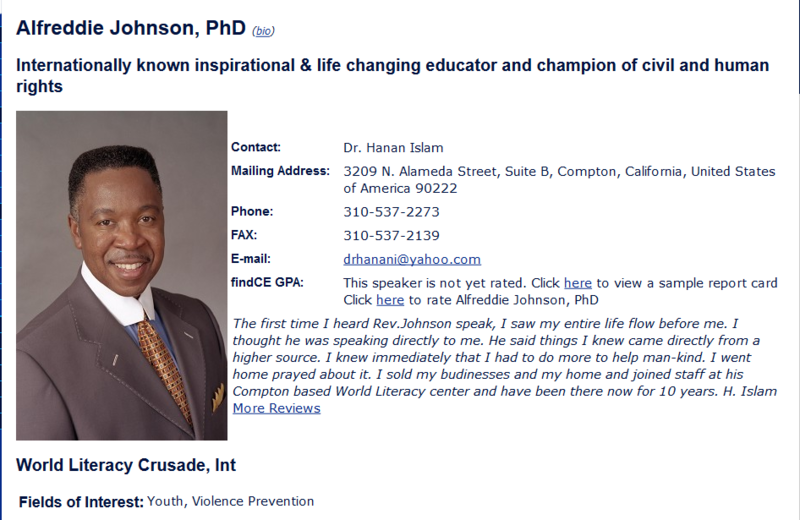 But even with the arrests and criminal charges against Hanan Islam, her children, the Compton educators, and other “counselors” at the clinic he co-founded, Alfreddie Johnson himself was not arrested or charged with a crime. The Underground Bunker is grateful to Jeffrey Augustine for showing up in court yesterday in Los Angeles to witness what we expected to be the first day of an important criminal preliminary hearing. Hanan Islam and three of her children were charged in 2015 with running an elaborate scheme to defraud the state’s Medi-Cal insurance program with the use of a Scientology drug rehab. The scheme also ensnared two high school principals and a prominent high school football coach, who all lost their jobs. It’s taken three years for the case to come to a preliminary hearing, but now it turns out we’re going to have to wait a little longer. Jeffrey tells us that the case has been delayed a month because the lawyer for one of the defendants, Hanan Islam’s son Rizza, died last week. The court assigned Rizza a new lawyer, and will reconvene the hearing on September 18. For a long while we have not had an exactly stated policy on building a public image. This after he was presented scientology’s highest honor by David Miscavige himself — an IAS Freedom Medal (though I challenge anyone to find a published photo from this event of Miscavige WITH Tony M — he appears to want to not be associated personally). Byrd and Pedroza got 6 years ..
Rizza Islam selling his brand of BS on Social media..
hes talking about the World Literacy crusade ..without mentioning it by name..
scamming people into doing Scientology and Purification Rundown . tick tock Rizza your trial is coming in days ..all those years of scamming my come back home to roost.